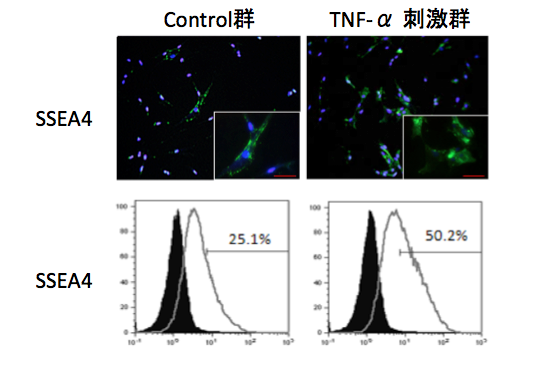 Ueda M, Fujisawa T, Ono M, Hara ES, Pham HT, Nakajima R, Sonoyama W, Kuboki T. A short-term treatment with tumor necrosis factor-alpha enhances stem cell phenotype of human dental pulp cells. Stem Cell Res Ther. 2014 Feb 28;5(1):31. 1) Hara ES, Ono M, Eguchi T, Kubota S, Pham HT, Sonoyama W, Tajima S, Takigawa M, Calderwood SK, Kuboki T. miRNA-720 controls stem cell phenotype, proliferation and differentiation of human dental pulp cells. PLoS One, 2013, 730(12), e83545. 2) Akiyama K, Chen C, Wang D, Xu X, Qu C, Yamaza T, Cai T, Chen W, Sun L, Shi S. Mesenchymal-stem-cell-induced immunoregulation involves FAS-ligand-/FAS-mediated T cell apoptosis. Cell Stem Cell. 2012 May 4;10(5):544-55.